Gyudon also known as beef Gyudon or beef donburi is Japanese traditional donburi dish made from stewed beef, onion and rice. Beef is simmered in salty-sweet sauce made from dashi, soy sauce and more. Gydon is well known as Japanese fast food, because it is fast, cheap and delicious dish. Gyudon's "Gyu" means beef, "don" means a bowl of rice in English. Yoshinoya which is one of the famous Gyudon restaurants chain use American beef's paper-thin slice of short plate for cooking Gyudon. Yoshinoya simmers it and onion in special sauce. On the other hand, common Japaese people use paper-thin slice of rib, brisket or flank for cooking Gyudon. They simmer it in sauce made from dashi, soy sauce, sake, mirin and suger. 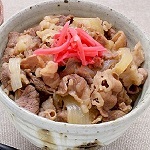 They often use Gyudon sauce or Sukiyaki sauce or Mentsuyu sold by Ebara or Moranbong or Kikkoman to cook it faster or without dashi, soysauce, sake and mirin. It is possible to easily complete the cooking by simmering beef and onion in this sauce diluted with water. These sauce is sold in many grocery stores in Japan. Mentsu is sold in Amazon USA, it is called Japanese Noodle soup base. The history of Gyudon goes back over 150 years, its origin is Gyunabe in Meiji period(1868-1912). Japanese people were prohibited eating beef until Meiji period. Gyunabe's "Gyu" means beef, "nabe" means pot and pot dish in English. It consits beef and welsh onion flavored with miso(Japanese bean paste). 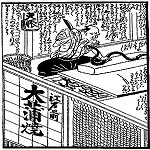 The chef of Isekuma in Yokohama was the first Japanese person to cook Gyunabe in 1862. In 1867, Kahei Nakagawa who was the first Japanese person to sell beef opened a Gyunabe restaurant in Tokyo. It was not prospering because of smelling of blood at first, but was prospering with improving that. Other Gyunabe restaurants opened in Tokyo one after another two years later, and Gyunabe spread rapidly. In addition, it was flavored with soy sauce and sugar instead of miso with the passing of the years. Because there was no need of removing offensive odor by improving meat qualities and fressness. In 1887, some people added vegetables except weksh onion, tofu(bean curd) and shirataki nodle made from konjac. Gyunabe became Sukiyaki then. On the other hand, some people poured left over soup of Gyunabe over a rice after eating beef and vegetables. People wanted to eat that cheaper and easier since Gyunabe was a little expensive dish for common people. Some restaurants opened to responded to the their request, and served cheap beef and rice poured Gyunabe soup called Gyumeshi. They prospered soon because Gyumeshi is very cheap. The price of curry and rice was five sen(about five cent in USA) aound 1890, but the price of Gyumeshi is one sen then. Other famous Gyudon restaurants, Nakau, Sukiya and Matsuya, opened after Yoshinoya. Matsuya call beef donburi Gyumeshi though it opened in 1966 because it is against Yoshinoya. Some Japanese often discuss which Gyudon restaurant is better. 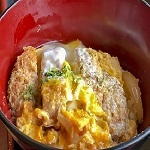 For details about Gyudon market and share, see Gyudon market and share. In addition, some Japanese BBQ restaurants called Yakiniku serve Gyudon. Jojoen which is one of the exclusive Yakiniku restaurants serve prime beef Gyudon. There are some special orders at Gyudon restaurants chain. "Tsuyu-daku" means adding more sauce than usual, "Tsuyu-dakudaku" means adding more sauce than Tsuyu-daku. It is said that this order have been used from 1950s. On the other hand, "Tsuyu-nuki" also called "Tsuyu-kiri" or "Tsuyu-giri" means reducing sauce. Kinnikuman(Ultimete Muscle) which is Japanese famous anime manga character says he likes Tsuyu-giri Gyudon. 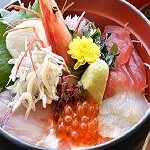 In addition, Japanese sprinkle various topping on Gyudon, red pickled ginger named Beni-shoga, seven flavered spices named Shichimi, soft-boiled egg and raw egg. Some Japanese order a salad as a side dish because of their health. A few Japanese sprinkle dressing for salad on Gyudon, this is a very rare case. It might to be a good idea to eat Gyudon when you travel Japan. You can experience Japanese culture through it. If you can not eat it in Japan, you can cook it easily with buying Gyudon or Sukiyaki sauce.